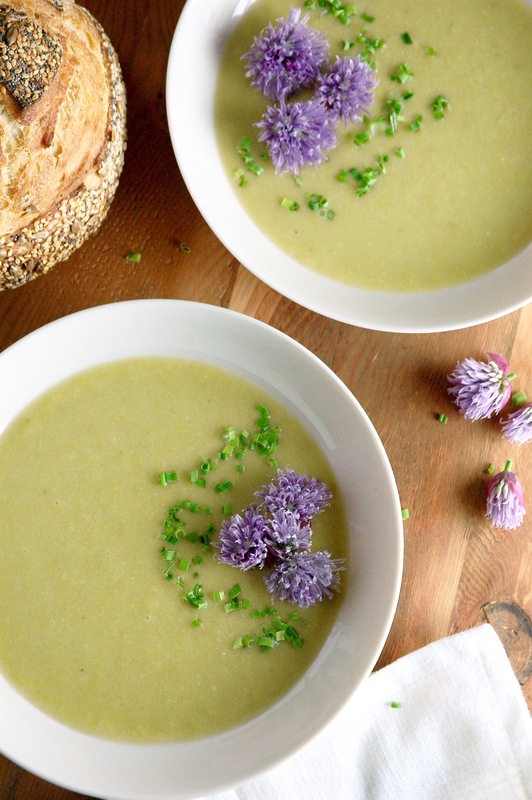 This creamy asparagus soup is one of my favorite soups to make in the springtime when asparagus is plentiful. When we’re wanting to do something a little different from the typical grill or roast or blanche preparation, this soup is the perfect way to showcase that lovely tender asparagus. It’s super easy, too! Simple flavors + not too many ingredients = my type of meal. You certainly don’t have to top your soup with chive flowers, but when I saw these at the farmers market I just couldn’t resist! They are so pretty, and tasty, too! Very oniony (you’ve been warned). Plus, they come attached to chives, so it’s kind of like a two-for-one deal. Give ’em a try if you see them at the market. Lately I’ve been working to simplify and streamline my processes in the kitchen, pare down the gadgets that aren’t multifunctional and more fully utilize those that are truly workhorses. I was inspired to do this after reading a kitchen spring cleaning article series on thekitchn.com, which then led me to reading Zero Waste Home by Bea Johnson. These are all good things, people! For example: Did you know that all you really need to keep your kitchen (and your whole home, honestly) sparkly fresh and clean is distilled white vinegar, baking soda and castile soap? For example II: Nick and I have replaced almost all our paper products with reusable cloths at this point (okay, okay, toilet paper has to stay). That’s serious money in our pockets, since we don’t have to shell out for paper towels and napkins and tissues each week (I have a very runny nose… very not economical!). My hope is that this kitchen (& life) simplifying process inspires more simply prepared recipes like this one in the future. If this soup is any indicator, it’s gonna be a tasty future! 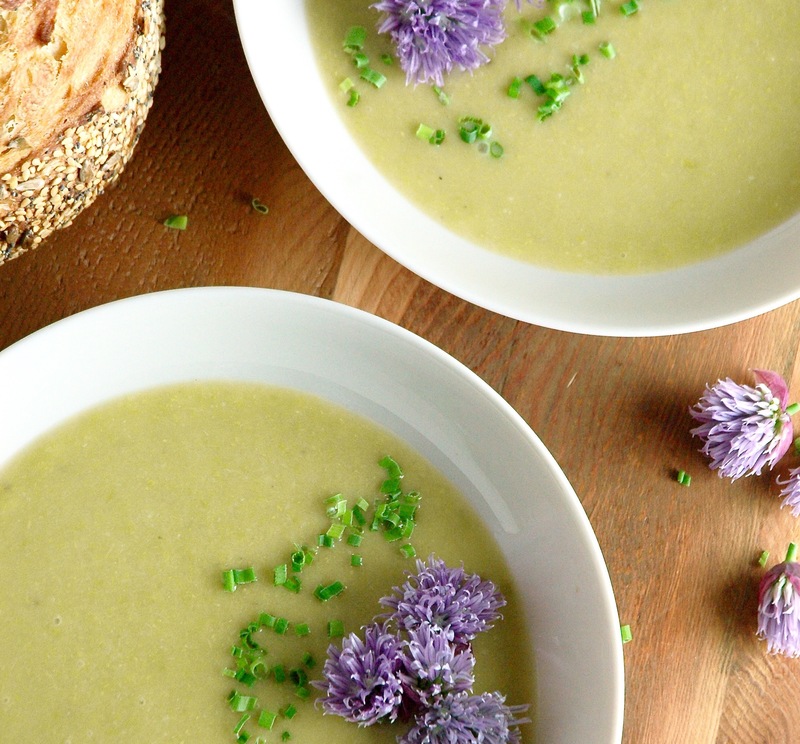 A simple and delicate asparagus soup that's light on the ingredient list but not on flavor! Earthy asparagus flavors mingle with tart fresh lemon juice. COOK: Heat butter and olive oil over medium-low heat in a dutch oven. Add chopped leek and garlic with a sprinkle of kosher salt and cook until softened and fragrant (about 6-8 minutes). Add the chopped asparagus, bay leaf, salt and enough stock or water to just cover the vegetables. Turn heat up to bring to a boil, then turn it back down to medium-low and simmer until the asparagus is fork tender. BLEND: Remove the pot from the heat, and let cool a bit. Remove bay leaf. Using an immersion blender, blend until the soup is smooth. It shouldn't be super thick but it will be creamy. Add water to thin as necessary. Juice about 1/2 the lemon directly into the soup. Stir to combine and season with more salt to taste. SERVE: Serve the soup with additional lemon wedges, fresh cracked black pepper and chives if using. We paired our soup with some room temp butter and a fresh baguette from the local bakery. *Something new I've been doing lately is saving my -clean- veg scraps for homemade vegetable broth. It is so much better than the store bought kind, and it's FREE. *An immersion blender works great for soups like this one. If you want to use a stand blender instead, make sure soup has cooled significantly and blend in batches before returning back to the pot and seasoning to taste. *This soup freezes great, if you have leftovers, or it'll keep in the fridge for 4-5 days.